Coming into yesterday’s Whirlaway, all the talk was of Eightyfiveinafifty, of his prodigious speed, of his impressive maiden win, of his recent high Beyer Speed Figure. His trainer, Gary Contessa, participated in a nearly two-hour live chat on Friday night (you can read the transcript here, and I recommend that you do, especially his answer to a comment about selling Peace Rules); and many local folks were rooting for the man known best for training New York-breds and dominating local standings. The other five horses entered got little in the way of attention. But if you were paying attention to New York racing in early January and reading David Grening’s Inside Post blog on January 2nd, the name Peppi Knows might have rung a bell. 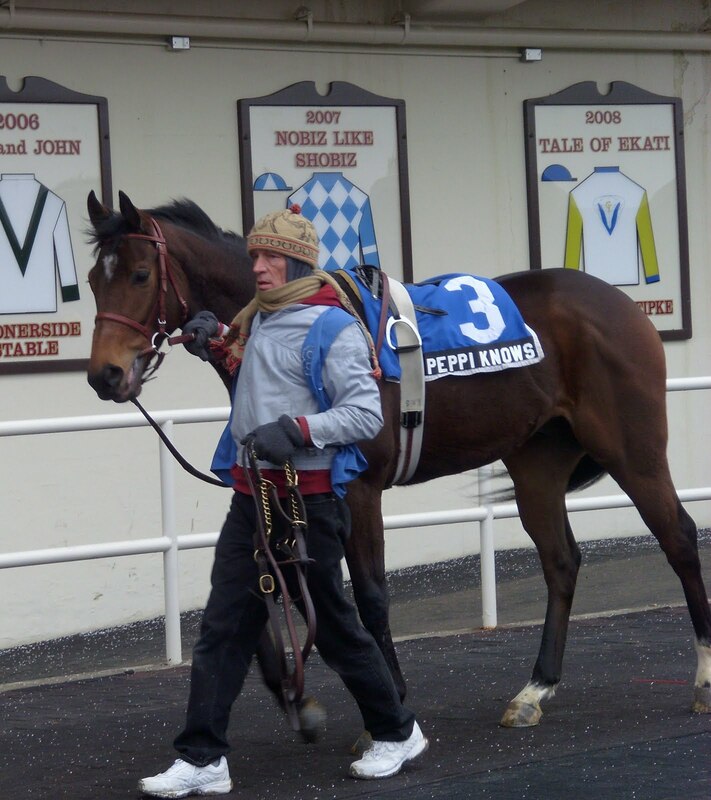 Peppi Knows had been entered by his trainer, Tim Kreiser, in the next day’s Count Fleet; on the morning of January 2nd, the New York stewards scratched Peppi Knows from the race because Kreiser hadn’t obtained workers’ compensation insurance, a condition of running in the race. Kreiser had never before run a horse at a New York Racing Association track and was told that he could not purchase workman’s comp insurance the day his horse was to race. He said he was informed on Friday — New Year’s Day, a day when he could not buy insurance _ by New York racing officials that his horse would not be able to run because of this issue. Kreiser didn’t pull any punches in discussing the situation with Grening. The trainer is based out of town and in early January, he seemed content to stay away from NYRA tracks. Clearly something changed in that month, because there indeed was Peppi Knows, back at Aqueduct, entered in the Whirlaway, 15-1 on the morning line and nearly 8-1 at post time. He sat off the pace set by Papa’s Nice Cat after Eightyfiveinafifty had bolted on the first turn, moving up around the far turn and drawing off in the stretch under Richard Migliore, withstanding a late run by Afleet Again. Owner’s decision or trainer’s, we’ll see Kreiser and Peppi Knows back at the Big A in early March, where the horse is expected to make his next start in the Grade III Gotham. Kreiser is a good trainer. Maybe they got lucky with the broken bit but the 17.40 mutuel was good to have. BTW, like your blog. I heard in the backstretch this morning that the owners of Eightyfiveinafifty had been offered several million dollars for their horse before the race, presumably by some well-heeled owner desperate for a Derby horse. Wonder if they think now that they should have taken the money. steve, in retrospect it seems an awful lot of money to leave on the table, especially in the current climate. Thanks, Mark. And thanks for the link on your site; I'll return the favor.